The Big Ten has clearly established itself as one of, if not the top conference in college basketball. But while the pecking order has been difficult to peg, each passing week brings more clarity as to how the teams stack up. The Nittany Lions fall to the bottom spot as the last winless team in Big Ten play. They sport the conference’s worst offensive efficiency, along with the lowest 3-point and effective field goal percentages, and a middle of the pack defense hasn’t been enough to make up for it. Lamar Stevens is having a solid season, ranking in the Big Ten’s top five in points and rebounds per game. But his play also has not been enough for Penn State to get a win. However, the Nittany Lions will have a good opportunity to change that on Saturday at home against Rutgers. The Scarlet Knights’ saving grace is their win over Ohio State, because not much else is going right for them. Last week they got destroyed at Purdue, and they lost at home to Northwestern. 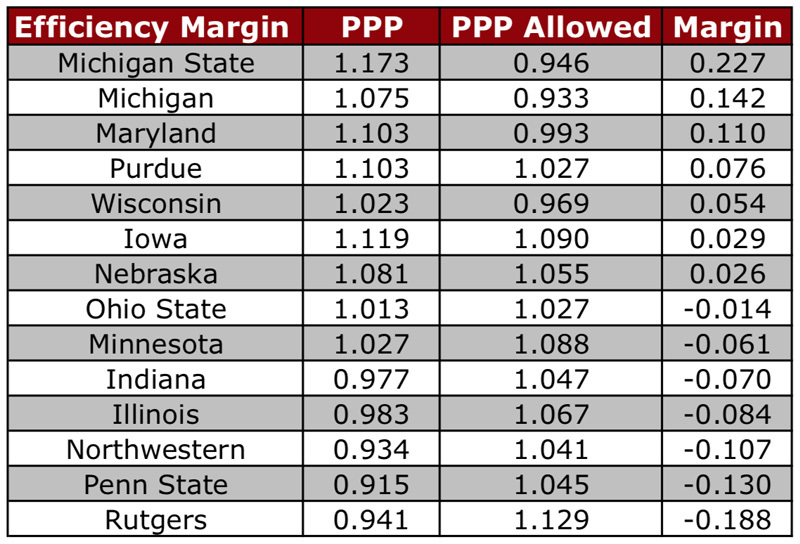 Rutgers’ defense is the Big Ten’s worst. Rutgers faces Nebraska and Penn State this week. Illinois climbs out of the cellar after picking up its first Big Ten win of the season, a 95-68 drubbing of Minnesota. The Illini got blown out at Iowa later in the week, but their offense improved enough in the last week to give them the edge over Rutgers. They’ll have two tough games this week, hosting Wisconsin and facing Maryland at Madison Square Garden. 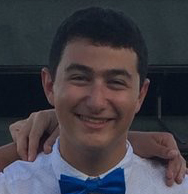 Northwestern won its only game last week against Rutgers despite Vic Law having a rough game. The Wildcats won’t win many games with Law shooting 2-for-10 and only scoring six points. But Dererk Pardon has been a solid player this season, and he had a big game against Rutgers. Northwestern’s offense remains one of the Big Ten’s worst, and while the Wildcats seem more like a (bottom of the) middle of the pack Big Ten team than one of the worst teams in the conference, their offense simply has to improve for that to remain the case. They’ll face a reeling Indiana on Tuesday and Wisconsin on Saturday. Minnesota’s loss at Illinois was the worst loss of the week in the Big Ten. Only one team all year has allowed the Illini to score more than the 95 they hung on Minnesota, and that was Evansville in the first game of the season. The Gophers edged out a win over Penn State later in the week. Jordan Murphy leads the conference in rebounding, nearly a full two rebounds per game better than Ethan Happ in second. But Minnesota’s defense needs some work to compete against the Big Ten’s best. The Gophers face Michigan and Iowa this week. Indiana is in full free-fall mode after last week’s performance against Nebraska and Purdue. 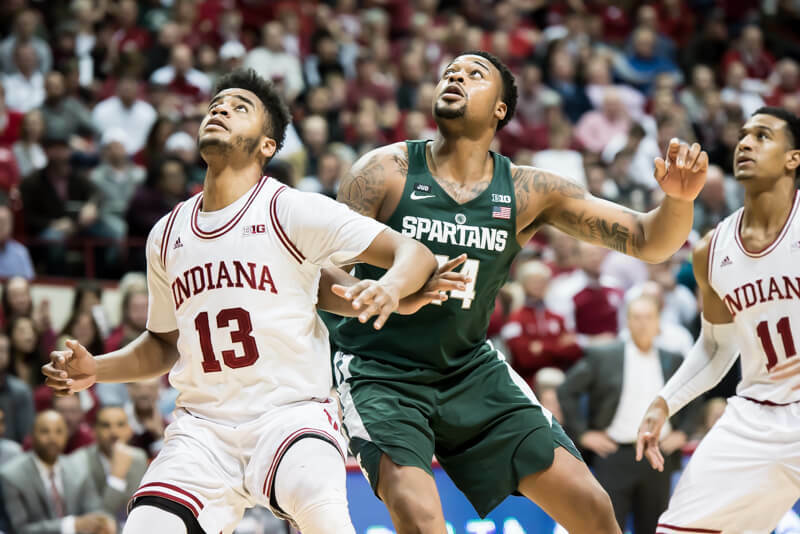 Romeo Langford and Juwan Morgan are having very good seasons, but opponents have been able to key in on those two defensively and Indiana has struggled to adjust. The Hoosiers will have to seriously improve their offense to end their four-game slide. IU faces Northwestern on Tuesday and Michigan on Friday with little margin for error remaining. The Buckeyes lost at home to the increasingly formidable Maryland on Friday. Suddenly, OSU hasn’t won since the calendar turned to 2019, a four-game losing streak. Kaleb Wesson has had a solid season in Columbus, but the Buckeyes need to show they can still win when he has an off game. They’ll have chances for solid Big Ten wins against Purdue and Nebraska this week. The Hawkeyes have found ways to win in spite of their horrendous defense this season. Having the second-best offense in the Big Ten helps. It’s a team effort with Iowa — its only player ranked in the Big Ten’s top 10 in any major stat is Nicholas Baer, who’s tied for fourth in the conference in steals. Iowa’s five-game winning streak will face a tough test on Thursday against Michigan State before the Hawkeyes host Minnesota on Sunday. Wisconsin’s win over Michigan was huge in so many ways. It’s the Badgers’ best win of the season by a mile. They’ve had many chances to pick up a signature win, including their road loss to Maryland last Monday. There’s no better way to rebound from a missed opportunity on the road than by beating the top team in the Big Ten at home. Ethan Happ is having another brilliant season. He’s second in the Big Ten in points and rebounds per game and he’s third in assists per game. Wisconsin plays Illinois and Northwestern this week. Much like Wisconsin against Maryland, Nebraska’s close loss to Michigan State at home has to feel like a missed opportunity for the Cornhuskers. Nebraska’s offense has slowed down a bit, but its defensive improvement has made up the difference. James Palmer Jr. is one of the top players in the conference, and when Isaiah Roby, Isaac Copeland Jr. and Glynn Watson Jr. play well, Nebraska is a tough team to beat. The Huskers face Rutgers and Ohio State this week. Purdue seems to be coming together at the right time. The Boilermakers coasted to big wins over Rutgers and Indiana last week, and their role players are beginning to step up and take (some) of the enormous burden off Carsen Edwards. Edwards, by the way, should be considered one of the favorites for Big Ten Player of the Year along with Ethan Happ and Cassius Winston. He averages 24.6 points per game and has shown the ability to single-handedly carry Purdue to victory. The Boilermakers visit Ohio State on Tuesday and host Michigan State on Sunday. The Terps have quickly escaped the log-jammed middle of the pack in the Big Ten. Maryland has clearly proven to be a cut above the rest of that group. If Wisconsin’s win over Michigan was the biggest win of the week, Maryland has to own the best pair of wins from last week, beating Wisconsin at home and Ohio State on the road. Anthony Cowan Jr. is having a stellar junior season, sixth in the conference in scoring and fourth in assists. The Terps have a chance for an even bigger statement win on Monday at Michigan State, and they play Illinois on Saturday in New York. Michigan suffered its first loss of the season at Wisconsin on Saturday, but the Wolverines should be fine. It’s more a statement on the strength of the Big Ten this year and how difficult it is to go undefeated in college basketball than it is anything about this team. The Wolverines have winnable games this week against Minnesota and Indiana, although Assembly Hall can be a tough place for opponents to win. The Spartans claim the top spot in this week’s power rankings after Michigan fell, but that’s not the only reason they made the jump. MSU had an impressive 70-64 win at Nebraska on Thursday. Michigan State has lived in the shadow of Michigan this season until now. The Spartans boast the conference’s top offensive efficiency and effective field goal percentage, and they’re second in defensive efficiency with the lowest opponent effective field goal percentage. Cassius Winston has played at an All-Big Ten level this season — he leads the conference in assists per game and is fifth in scoring. MSU faces a tough home test against Maryland on Monday before visiting Iowa on Thursday.